Public Service (Police) Writers Conference. July 11-14, 2013 Las Vegas, Nevada. Presentation on the early mystery writers that got their inspiration from actual crimes. Early Detectives in Fact and Fiction it is. And on panel, Real vs Reel. CSI facts or fiction in TV, books and movies. Gatsby’s Books 5535 E. Spring Street, Long Beach, Saturday October 13th, 2012, at 2pm, Steve will discuss his novel and be available for questions about CSI, Forensics and writing. Men of Mystery, November 17, 2012, Irvine Marriott. Many great mystery writers including John Lescroart, James Rollins and many more. 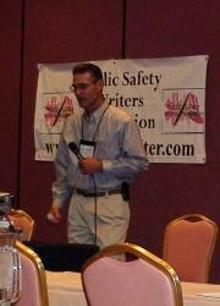 November 1st, , "Write Forensics Right" for the Henderson Writers Group, Las Vegas, NV. Nov. 19th 2011 Men of Mystery, mystery author conference, Irvine, Ca. Scrafitto won 1st place in the annual Public Safety Writers (Police Writers) Association writing competition for unpublished novel. 1st place. Visit the PSWA website here. Great people, great networking possibilities, join the PSWA.